Using Privacy Zones is another tool you can use to control your privacy. You can use these to obscure sensitive locations like your home, school, or workplace. Starter accounts will be able to create up to 3 Privacy Zones and activate/deactivate them once a month. 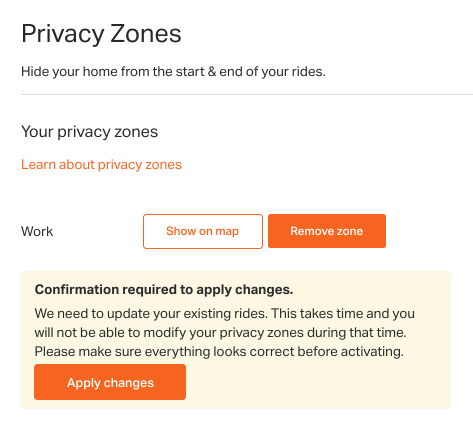 Privacy Zones will only affect RIDES that you have recorded. Any ROUTES you have created will not be hidden by the Privacy Zone. Any routes with sections you wish to keep private should be saved as PRIVATE, JUST ME when created. See full rides, including portions that fall inside of their privacy zones. All other users see only the portions of their rides that fall outside of their privacy zones. Unlimited number of privacy zones. Modify privacy zones as frequently as needed. 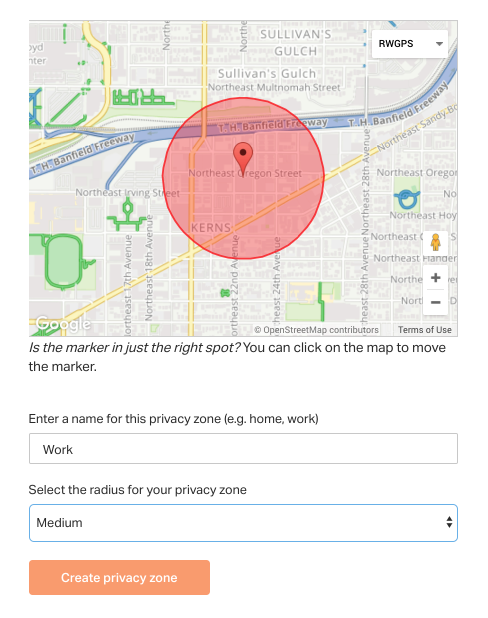 Set the center point of the zone by entering an address or by clicking on the mini-map. Give your zone a name such as Home, Work, or School. The name is just for your own information. Nobody else will see these privacy zone settings. Select the size of your privacy zone from the drop down list. Click the CREATE PRIVACY ZONE button. Before activating this zone, create any additional zones you wish. Up to 3 zones for Starter subscribers, unlimited zones for Premium and Basic subscribers. Make sure all your zones are defined before applying changes as this can only be done once a month for Starter accounts. You will be prompted to verify your request as well as be notified of the features available for Premium users. 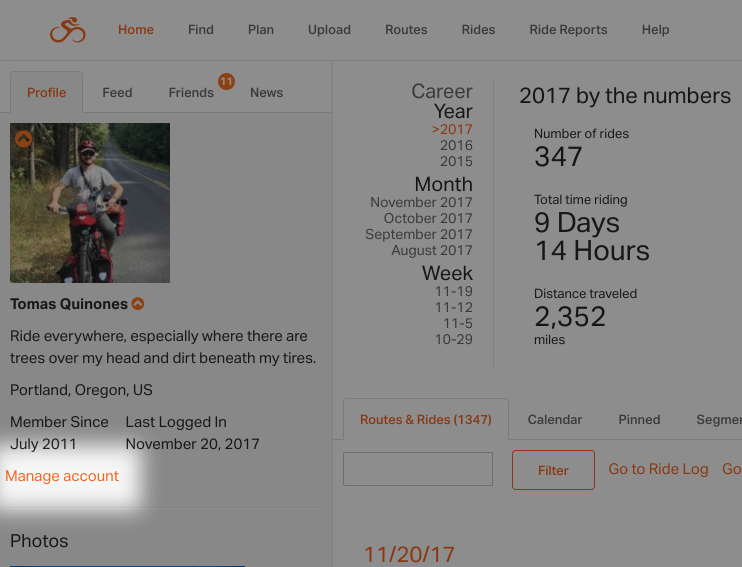 Click the APPLY CHANGES button to apply the zones to your existing rides and rides to be uploaded. You will be prompted one more time to finalize your Privacy Zone. Click the APPLY CHANGES button in this prompt to finalize and apply your privacy zones. After the zone changes have been applied, the site will start processing your history of rides. Depending on the number of rides you have this may take a few minutes. You can refresh the page or come back to it at any time to see if this is complete. How many zones can I create? Free and Basic accounts can create up to 3 privacy zones and activate/deactive them at most 1 per month. 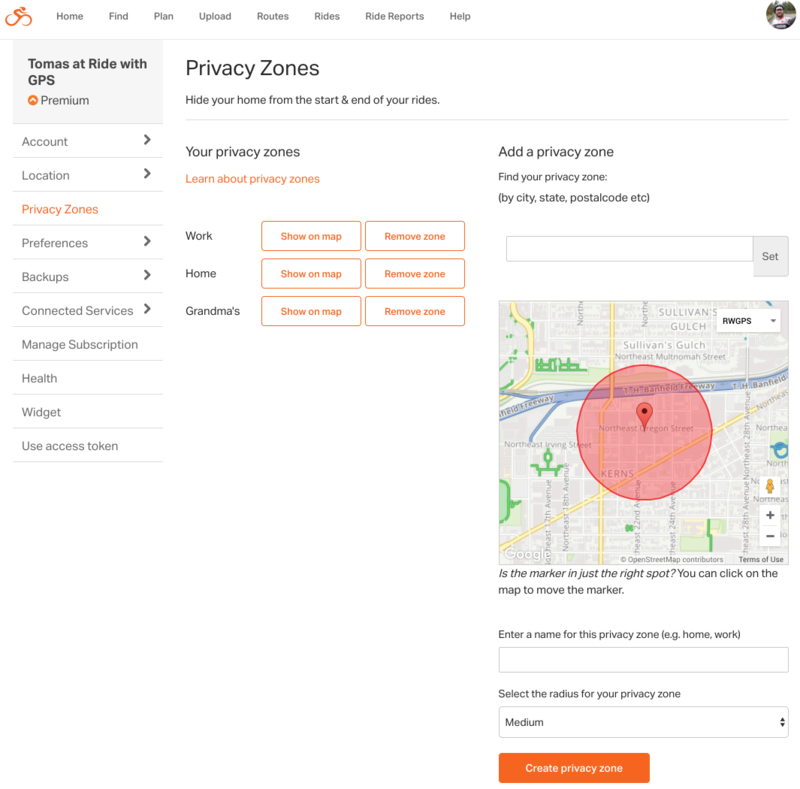 Premium users get unlimited privacy zones and can activate/deactivate them at any time. Do I have to activate individual zones? Create the zones you want then activate them all at the same time. Creating a zone then activating it then creating the next zone will take a lot longer to process all your rides. If my ride is set to Public or Friends only, will they be able to see my rides in these zones? They will only be able to see the ride up until it enters a zone. My ride passes through one of my privacy zones, will the ride get cut in half? The privacy zone will not affect the middle of a ride. It will only obscure the beginning and end of a ride. So if you stop at home for a snack in the middle of a ride then go out again, it will be displayed on the ride. I need to move the location of a privacy zone but it won’t let me. You will need to delete the old zone then create a new zone with the correct location. 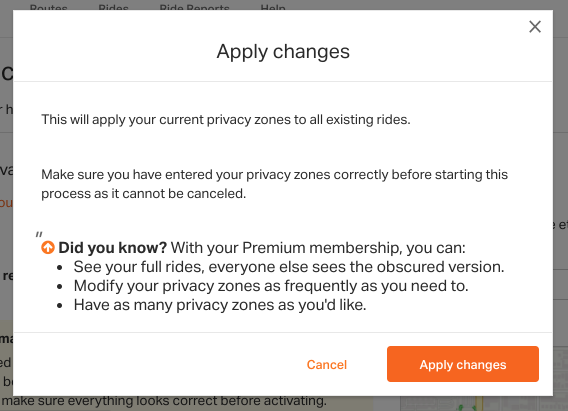 Why aren’t my privacy zones being applied to my rides yet? Make sure you have clicked the APPLY CHANGES button to apply the zones to your existing and future rides.